On his third tryout in the spring of 1910, right-handed pitcher Frank Lange finally made the roster of the Chicago White Sox. With Lange just coming off a 29-win season for the Des Moines Boosters of the Class A Western League, White Sox management held high hopes for him. And on occasion Lange would validate those hopes, exhibiting flashes of hurling brilliance. But erratic control and chronic arm miseries hampered Lange during his relatively brief Chicago tenure. By early 1914 Frank Lange’s once-promising professional career was over, and he was consigned to spend the remainder of his life running a Wisconsin tavern/hotel. Frank Herman Carl Lange was born in Columbus, Wisconsin, on October 28, 1883, the fourth of at least 11 children born to August Wilhelm Lange (1854-1914) and his wife, the former Hanna Louise Fredericka Voth (1855-1924).1 The elder Langes were German Lutheran immigrants who arrived in America shortly after their September 1877 marriage. Once in Columbus (in south central Wisconsin, about 30 miles from the state capital, Madison), August found long-term employment with the C.M. & St. Paul Railway, eventually rising to the position of track repair crew foreman. His wife, meanwhile, tended the ever-expanding Lange brood. As a boy Frank was given the nickname Seaganbuck (the meaning of which is unknown to the writer) by his father’s German-speaking co-workers.2 Later shortened to Seagan, it would be Frank Lange’s hometown moniker for life. Frank attended school through the eighth grade and thereafter found work around town as a day laborer.3 In his free time, the well-built (eventually 5-feet-11, 180 pounds) Lange hunted, fished, and played baseball on local sandlots. He first attracted public notice in 1905, pitching for the Kurth Brewery team, a first-rate Columbus semipro club. Lange made his professional debut the following year, winning 13 games and losing 11 in 215 innings pitched for the Wausau Lumberjacks of the Class D Wisconsin State League.4 He returned to Wausau for the 1907 season, but his statistical record from that year has not survived. Inferentially, however, Lange must have pitched well, for he was drafted by the Chicago White Sox at the close of the season.5 In the White Sox spring camp of 1908, he sought to land a berth on an American League pennant contender already well-provisioned on the mound. With Hall of Famer Ed Walsh and veterans Frank Smith, Doc White, Frank Owen, and Nick Altrock assured staff spots, Lange had little real chance of making the club and was returned to Wausau at the close of the exhibition season. No 1908 pitching statistics from Wausau are available6 but again, Lange must have performed well, as Chicago reacquired his contract after the season was completed.7 As in the previous spring, competition for spots on the 1909 White Sox staff was keen, with Lange among those “pitching like fiends [and] registering shutouts even in easygoing practice games.”8 Still, Lange was cut once again, optioned to Des Moines of the Western League at the end of camp. In Des Moines Lange blossomed, combining with fellow White Sox prospect Frank Miller to form the Western League’s dominant pitching tandem. In 52 games, Lange went 29-12, leading the circuit in wins and strikeouts (328). Between them, Lange and Miller (24-16) compiled almost 700 innings pitched for the Boosters, whose 93-59 final record was good for a razor-thin margin over the Sioux City Soos (94-60) in the WL pennant chase. And once again, Lange was drafted by the White Sox at season’s end.9 But unbeknownst to Chicago brass, the grueling 1909 campaign had taken its toll on Lange’s right arm. Virtually assured a roster spot on his third visit to the White Sox spring camp, Lange pitched well when his arm permitted, as witnessed by a ten-strikeout complete game tossed for the Sox yannigans in an early April exhibition game against his erstwhile Booster teammates in Des Moines. But arm problems and erratic control of the sweeping curveball that was Lange’s out pitch delayed his appearance for Chicago during the regular season. Lange’s major-league debut was deferred until May 10, when he pitched three innings of one-run relief of Frank Smith in a 6-1 loss to the Philadelphia A’s. Thereafter, manager Hugh Duffy employed Lange as a spot starter and long reliever, again as the condition of his tender right arm permitted. When healthy, Lange was formidable, with a 13-strikeout 3-0 victory over the New York Highlanders on September 20 being his season’s highlight. Although limited to 130? innings, Lange showed great promise. Pitching for a punchless sixth-place (68-85) White Sox club, Frank had gone 9-4, with a sparkling 1.65 ERA. He had also batted a solid .255, with 8 RBIs in 51 at-bats (for a team that posted a .211 team batting average as a whole), and would become a regular pinch-hitter in ensuing seasons with the Sox. With his career approaching the crossroads, Frank Lange returned his signed contract for the coming 1912 season “with the statement that his lame elbow has entirely disappeared.”16 But the White Sox and Lange seemed stuck in neutral that season. Both the club’s fourth place 78-76 log and Lange’s 10-10 record in 165? innings pitched, with another team-high ERA for starting pitchers (3.27), were near mirror-images of their 1911 marks. Still, tantalizing instances of pitching artistry, like a late-season three-hitter he threw against Philadelphia, kept the club interested in Lange. But with management growing ever more impatient with his lack of progress, the 1913 season shaped up as Lange’s last chance to fulfill expectations in Chicago. Early signs were encouraging. From the White Sox’ 1913 spring camp, Sporting Life correspondent Tobin reported that “Lange looks better than he did in 1912, and that means his curveball seems to be more elusive than ever and, what is better, his control of it was showing improvement every day he pitched.”17 Sadly, Lange could not hold that form once the regular season began. Given a start on the second day of the 1913 campaign, Lange was hit hard by Cleveland and driven from the box early in a 9-2 loss. Starting assignments came rarely after that, with Frank relegated largely to mop-up duty. One of his last White Sox appearances occurred on July 13, when Lange relieved one-time Des Moines teammate Frank Miller, shelled in his major-league debut.18 A week later Lange appeared in his final major-league game, a brief relief outing against Washington. With his record standing at 1-3 in 12 games with an inflated 4.87 ERA, Lange was finished in Chicago. 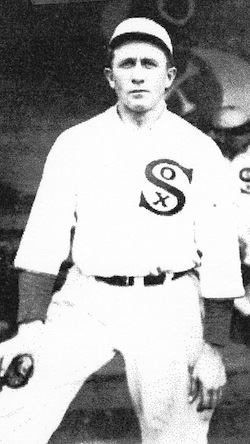 On August 20, 1913, the White Sox dealt Lange, infielder Morrie Rath, and outfielder Wally Mattick to the Kansas City Blues of the Double-A American Association in exchange for shortstop Jim Breton, a Chicago native who would prove a bust with the Sox. Over four major-league seasons, Frank Lange had posted a 28-25 (.528) record in 95 games, all with the White Sox. In 498? innings, he had posted a 2.96 ERA, striking out 318, while walking 219. Given the promise that had attended his arrival in spring camp in 1910, the Lange career had been one of unrealized hopes. Once in the uniform of a minor-league club headed for a seventh-place (69-98) finish, Lange pitched poorly. In nine starts for Kansas City, he went 2-7, surrendering 47 hits and walking 29 in only 58 innings pitched.19 Nevertheless, Lange was expected to return to the Blues for the 1914 season. In the meantime, he returned home to Columbus, Wisconsin to ponder his changing baseball fortunes. On November 20, 1913, he altered his domestic situation as well, marrying Emma Herzberg, a waitress whom he had met while pitching in Chicago. The couple would remain together for the next 32 years but have no children. For reasons unknown to the writer, Lange chose not to report to Kansas City for the 1914 season. The club formally suspended him on May 8, 1914.20 The discipline was of no concern to Frank, as he had decided to put his playing days behind him. He now made his livelihood as the manager of a tavern/hotel in Columbus owned by a man named Albert Klatt.21 In time, Lange assumed ownership of the business. During Prohibition he kept the place open, operating the downstairs as a speakeasy, while the upstairs became “a house of ill fame for the sporting crowd.”22 Something of a character in middle age, Frank enjoyed bantering with the tavern clientele and showing visitors the scrapbook he kept of his ballplaying career. 23 When Prohibition was repealed in 1933, Lange reopened the premises as Seagan’s Fountain Inn, a popular local watering hole and lodging that he and Emma operated for the remainder of Frank’s life. In September 1938 Lange served as an honorary pallbearer at the funeral of Wisconsin pitching pioneer Pink Hawley. Seven years later, his own demise beckoned when he was stricken with esophogeal cancer. Toward the end, his condition was complicated by the onset of bronchial pneumonia. Removed to Wisconsin General Hospital in Madison, he died there on December 26, 1945. Frank Lange was 62. After funeral services, he was laid to rest at Hillside Cemetery in Columbus. Survivors included his wife, Emma Herzberg Lange; his brother Ernest; and his sisters Amelia Woodill, Anna Bessert, and Elsie Lind. After Frank’s death, his widow sold the premises that bore his hometown nickname. But fond memories of Frank Lange lingered in Columbus for decades. The writer is indebted to Deadball Era Committee member Dave Stalker, an expert on early Wisconsin ballplayers, for his careful review of this profile in draft form. 1 Sources for the biographical information contained in this biography include the Frank Lange file and questionnaire at the Giamatti Research Center, National Baseball Hall of Fame and Museum, Cooperstown, New York; US Census data and Lange family tree information accessed via http://www.ancestry.com; and various of the newspaper articles cited herein, particularly the Lange obituaries published in the Wisconsin State Journal, December 26, 1945, Columbus (Wisconsin) Journal Republican, December 27, 1945, and The Sporting News, January 3, 1946. 2 According to a letter by Monte McCormick of the Wisconsin State Journal, dated July 29, 1969, contained in the Lange file at the Giamatti Research Center. Seaganbuck does not appear in the German-language dictionaries consulted by the writer. The closest thing found to it is ziegenbock, meaning a male goat. 3 Lange questionnaire at the Giamatti Research Center; 1905 Wisconsin state census. 4 Unless otherwise noted, statistics cited herein have been taken from baseball-reference.com. 5 Sporting Life, October 26, 1907; Chicago Tribune, April 3, 1908. Research by Cliff Blau suggests that Lange's 1907 stats were misattributed to a Madison player named Lang, and that Frank went 28-7 that season. 6 Baseball-Reference does provide batting stats for the 1908 Wausau Lumberjacks. Always a capable hitter, Lange posted a .249 BA (42-for-169) that season. 7 Sporting Life, November 28, 1908. 8 Sporting Life, April 3, 1909. 9 Sporting Life, September 11, 1909. Chicago drafted Frank Miller, as well. 10 Sporting Life, June 24, 1911. 11 In the offseason, Lange stayed in shape by fishing, hunting, long-distance walking, chopping wood, and refereeing lumberjack camp wrestling matches, as per the Chicago Tribune, January 26, 1913. 12 Chicago Tribune, July 15, 1911. 13 Sporting Life, August 19, 1911. 14 As reported in the Washington Post, August 29, 1911. Lange batted .289 with 16 RBIs in 76 at-bats for the still offensively challenged White Sox of 1911. But his dismal fielding ability – an .886 lifetime fielding average as a pitcher -- soon led to termination of the outfield experiment. 15 Sporting Life, September 9, 1911. 16 Sporting Life, February 10, 1912. 17 Sporting Life, April 5, 1913. 18 Frank Miller never pitched another game for the White Sox, but later enjoyed a respectable six-year career as a National League pitcher. 19 Baseball-Reference provides no data on Lange’s tenure with the Kansas City Blues. The record proffered above has been derived from 1913 box scores published in The Sporting News. 20 Official Bulletin No. 16, reported in Sporting Life, May 23, 1914. 21 As reflected in Lange’s World War I draft registration card. 22 According to Bill Moen and Doug Davis in Badger Bars and Tavern Tales: An Illustrated History of Wisconsin Saloons (Woodruff, Wisconsin: The Guest Cottage, Inc., 2004), 42. 23 Milwaukee Sentinel, March 17, 1932.